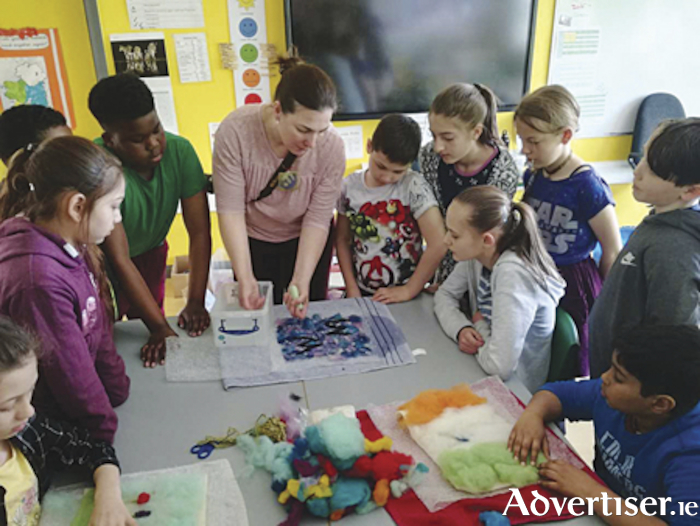 The Design and Crafts Council of Ireland (DCCoI ) has issued a call out to primary school teachers in Athlone and its environs to engage professional craftspeople in visual arts projects through their local education centre. Funded residencies are available through DCCoI’s CRAFTed programme and primary school teachers can apply now through the Athlone Education Centre. The application form is available on www.learncraftdesign.ie and applications will be accepted until the end of November 2018. Planning meetings will take place in February 2019 with a view to the classroom projects taking place from February to May 2019. DCCoI’s CRAFTed programme gives primary school children and teachers an exciting opportunity to stretch, bend, and extend their creative margins and learn the skills of various craft disciplines by working with professional craftspeople. Last year, CRAFTed ran in 77 schools nationwide with 77 teachers, 70 trained craftspeople, and some 2,000 children participating in the programme. Students all over Ireland developed skills by exploring textiles, silver smithing, ceramics, woodwork, animation, willow weaving and fashion design, all explored through the wider curriculum. CRAFTed is the Design and Crafts Council of Ireland’s nationwide primary schools programme delivered in partnership with the Association of Teachers’/Education Centres in Ireland (ATECI ) and at its core is a desire to inspire the confidence of all involved – teachers, craftspeople, and students – so that they may engage with craft and design as a means to explore and grow their own creative skills. Rooted in the development of good collaborative practice between craft practitioners and teachers, the programme promotes craft and design as effective tools for the support and delivery of integrated learning methodologies and the visual arts curriculum. With an emphasis on numeracy and literacy skills, CRAFTed investigates how craft processes can contribute to learning in other subject areas such as the social, environmental and scientific education curriculum. The CRAFTed programme for 2019 is currently being developed. Primary schools interested in learning more about participating in the programme are encouraged to visit the Design and Crafts Council of Ireland’s education website, www.learncraftdesign.ie, and to contact their local education centre for an application form. CRAFTed is delivered in partnership with the Association of Teachers’/Education Centres in Ireland (ATECI ).